Straight teeth aren’t only more attractive – they can also contribute to good oral health and improved wellbeing over the years! If you've lived most of your life with noticeably misaligned or uneven teeth, let our experienced dentists at Murphy Family Dentistry talk to you about the dramatic benefits of orthodontic care. Many people associate braces with children or teenagers only, but the truth is that more adults are wearing braces now than ever before. Why Choose Murphy Family Dentistry for Orthodontics? As your child's smile develops, Dr. Najari and Dr. Nguyen will pay close attention to the alignment of his or her teeth. We want to provide our young patients with proactive care whenever possible. Tackling issues like thumb sucking and mouth breathing at an early age can often help us prevent small problems from escalating into larger problems. If your child requires additional care during adolescence, we will create a comprehensive treatment plan that includes braces and a retainer. Straightening your smile has obvious benefits from a cosmetic standpoint, but there's more to adult orthodontics than that. Many adults also seek braces to treat symptoms related to a neuromuscular condition. These symptoms might include earaches, headaches, dizziness, and neck pain. Correcting your bite can help you alleviate your symptoms while simultaneously improving your smile's function and beauty. 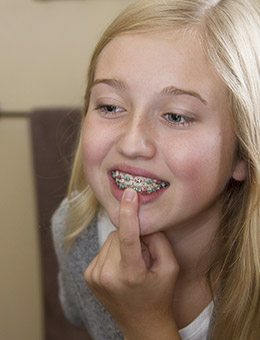 Many older teenagers and adults understandably don’t want to spend months or even years of their life wearing noticeable metal braces. In this case, you may want to explore Invisalign Clear Braces as an image-friendly alternative here in Murphy. 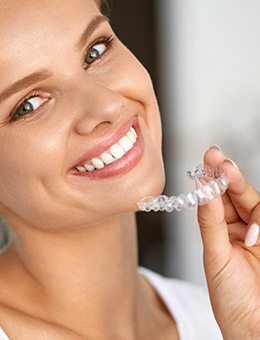 Instead of brackets and wires, patients will wear a series of clear, custom-made aligners that are pleasingly subtle; it’s likely that most people you pass in a day won’t even notice them. They’re also removable, which means that you can continue to enjoy all of your favorite foods and even brush and floss at home like normal. Would you like to learn more about our orthodontic services? Don't hesitate to give our Murphy dental office a call. We would be happy to schedule an orthodontic consultation for you. During your appointment, we'll explain how your treatment will proceed and answer any questions you might have about the process. We love helping our patients create beautiful, healthy smiles.